Order: Cell body covered with theca; cingulum (horizontal groove) and sulcus (vertical groove) consipicuous. 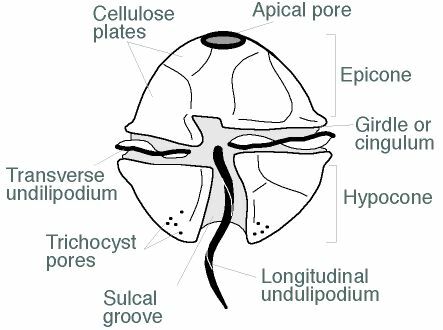 Family: Apical pore present (Illustrations of The Japanese Fresh-water Algae, 1977). Genus: Body round to polygonal; cingulum median, deep; thecal plates 5-6 in cingulum; some with apical and antapical horn (Illustrated Guide, 1985). 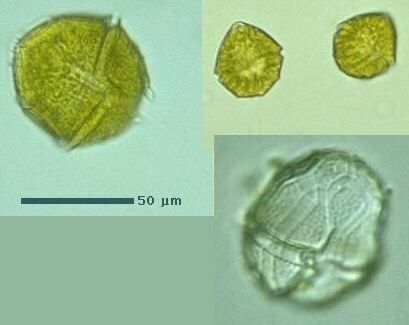 Epicone (or epitheca) consists of 11-14 thecal plates; hypocone (or hypotheca) of 7-8 thecal plates (Illustrations of The Japanese Fresh-water Algae, 1977).